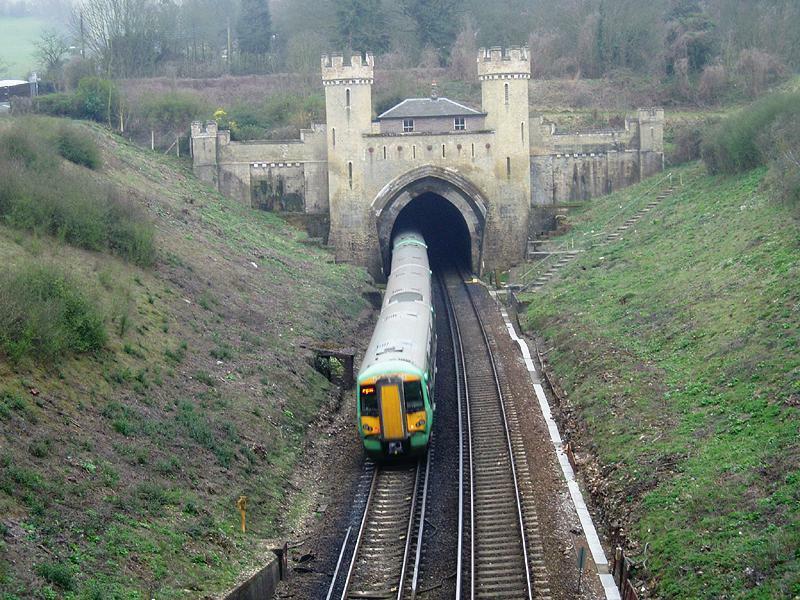 Millions of commuters pass through the tunnel at Clayton on the London-Brighton line every year though few actually know about, let alone manage to spot, its grand northern entrance. Many of them read Latest Homes on the train, as perhaps you’re doing now, so railway history is particularly relevant, even if you’re not a train-spotter (like me). Construction of the London-Brighton line commenced in 1838. The work was undertaken by 6,206 men, 960 horses and 5 locomotives and was completed by 1841. Initially, there were just six trains each way per day so there would have been no excuses for not leaving on time. The original line between the stations at Brighton and London Bridge was 50 miles long with five tunnels; namely Merstham, Balcombe, Haywards Heath, Clayton and Patcham. I noticed the Clayton Tunnel entrance quite by accident after taking a wrong turn on the way to photographing another building. From the road, I could see the two castellated turrets protruding from the railway cutting. I soon realised that the building was in fact the Grade II Listed entrance to Clayton Tunnel, which I had heard lots about already, but had never actually seen. It is the longest of the five tunnels at 2,266 yards and is up to 270 feet below ground. The entrance (pictured) is on the north end; the other end is actually very plain. The cottage above was originally built as a wage office for the railway workers and is said to be haunted. Clayton Tunnel was the scene of a horrific rail crash in 1861. Due to earlier complications, three trains left Brighton for London in quick succession. There were signal problems and the second train stopped in the tunnel to avoid catching the first. The third then steamed into the tunnel with disastrous consequences. There was an awful collision and the third train demolished the rear coach of the second train and came to rest on the next coach along. 25 people were killed and 176 injured. I tried to catch a glimpse of the tunnel entrance on the train from Victoria last week and it was actually possible to spot it. Coming from London, it is after Gatwick as the train approaches the Downs; therefore less than ten minutes away from Brighton Station. You now have no more excuses for staring out of the window aimlessly or falling asleep on your train.